This is outdoor print solution. 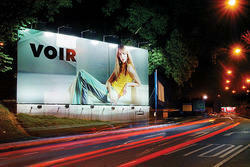 Our flex signage are ideal for digital printing of any format. These flex signage boards find excessive use in roadside hoardings and banners due to their property of with standing tough environmental conditions. 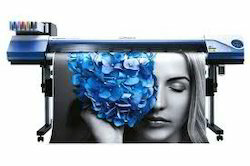 This is the branded machine print in frontlite flex print, backlite flex print, hording printing, blackout printing etc. Flex and Vinyl printing to match every requirement. We offer frontlit flex printing by using branded flex material and printing available in solvent and eco-solvent, flex mounting to the frame structure. Our company has achieved widespread recognition in providing Frontlit Flex Printing Service to the clients. Frontlit Flex Printing Service is offered with the help of the experts who have good experience and knowledge of Printing. This service is widely cherished for hassle-free management, timely execution and dependability. Backed by skillful experts, we are proficient in rendering Flex Printing Service. These services are enormously appreciated in the market due to their timely completion. Offered services are rendered in varied forms and terms that meet on customer’s demand. Banking on the skills of our qualified team of professionals, we are involved in providing Frontlit Flex Printing Service. We are presenting Frontlit Flex Printing to our clients. These services are highly praised by the clients for their durability and reliability. Our services are well-liked by the clients for their different use. Moreover, we assure our clients to deliver hi-tech services to the clients.